Wilfrid J. Wilkinson, a retired chartered accountant, was a founding partner of Wilkinson & Company, a public accounting firm. He is a past-president of the Public Accountants Council – Province of Ontario, and a past Treasurer of both the Canadian Institute of Chartered Accountants and the Institute of Chartered Accountants of Ontario. He is also a member of the Institute of Chartered Accountants of Quebec and was elected a Fellow of the Ontario Institute of Chartered Accountants. After retiring from accountancy in 2001, Mr. Wilkinson was the part-time executive director of the Quinte Ballet School of Canada. He has also been Chair of the Trenton Memorial Hospital Foundation, a founding chairman of the Belleville Cheshire Home for Physically Handicapped Adults, chairman of the Board for Loyalist College and president of the district council of the Boy Scouts of Canada. 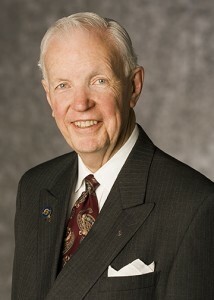 A Rotarian since 1962, Mr. Wilkinson is a member and past president of the Rotary Club of Trenton, Ontario. He has served Rotary International as president, vice-president, director, trustee of The Rotary Foundation and district governor. He has also been an International Assembly discussion leader and chairman and member of several Rotary committees including chairing the Rotary International Centennial Convention at Chicago in 2005. As a member of the International PolioPlus Committee, Mr. Wilkinson has been dedicated to the global effort to eradicate polio. He participated in National Immunization Days (NIDS) in Kenya, Tanzania, India and administered polio drops to children of Afghan refugees in Pakistan. He has also been a Health, Hunger and Humanity Program volunteer to India. In addition, Mr. Wilkinson has had Rotary assignments in South African, Namibia, the United Kingdom, Europe, Australia and New Zealand and many regions of the United States and Canada. During his Rotary Presidential years, he and his wife Joan visited fifty-seven countries. Mr. Wilkinson has been recognized for his humanitarian service by the Knights of Columbus, the Province of Ontario, the government of Canada and in 2001 was honored by Pope John Paul II with the Pro Ecclesia et Pontifice medal. In 2007, the Governor General of Canada appointed him a Member to the Order of Canada. During his year as President he was honored by the countries of Colombia, Italy, Madagascar and Pakistan, and received an Honorary Doctor of Business Administration degree from Chungbuk National University in South Korea, and an Honorary Doctor of Laws from Queen’s University, Kingston, Ontario. He is also the recipient of many Rotary honors, including the Citation for meritorious Service, The International Service Award for a Polio-free World, the Distinguished Service Award and Service Above Self Award.